It is said that marriages are made in heaven. And, apparently, it's not just about human pairs. Of course, in the world of pedigreed cats everything is arranged a little differently. Here the breeder is the King and God, and he performs cat fates on earth! But we are not always able to do it. Now I will explain you why. When I planned this mating and already imagined future kittens with round heads and sparkling silvery coats (as their father has), as well as with the large eyes of young grass color (as their mother has), I did not expect that I will have to face the problem. The time has come, Michel had several estrus, but our Mike completely ignored her as a female. Moreover, he apparently recalled how in his childhood he was sometimes beaten by Michelle, who at that time was feeding her babies and driving away from them all and everyone passing by. In general, he was afraid of her, like she was a fire! I did a lot to reunite them - nothing helped. I already lost all hope that the coveted kittens from this couple will be born in my cattery, but Miracle (otherwise it will not be called) happened!!! Whether God heard my night prayers, or Michel could "fall in love" with Mike and the call of nature defeated his childish fear of her! Now for me it does not matter! The most important thing is that on July 10, 2017, the mating took place and continued for three more days and three nights! My happiness was boundless! I spent a whole month "holding my fists" in anticipation of the rounded tummy of Michel. And now, I can already exhale and look forward to the day "X" in the middle of next month! I feed the future mummy with delicious food and vitamins, gratefully kiss the future dad and make up the color formulas of future kittens. So, what am I waiting for? 🙂 Firstly, I wait, like any breeder, for easy deliveries, healthy, beautiful kittens in good breed type (ideally - the type is even better than that of parents). And only show class (joke)! Possible colors: ns 11 (black silver shaded), ns 25 (black silver ticked), ns 11 33 or ns 21 (25) 33 are possible (same colors, but in pointed variations, ie kittens with blue eyes instead of green ones), diluted colors are also possible (blue instead of black) - as 11, as 11 33, as 25, as 21 (25) 33 or carriers of dilution and color-point genes. In June of this year, Mike (Favorit-s N'Mike) and Michel (Michel' Artisan) took part for the first time in the cat show in the open class, but despite this, they showed excellent results! 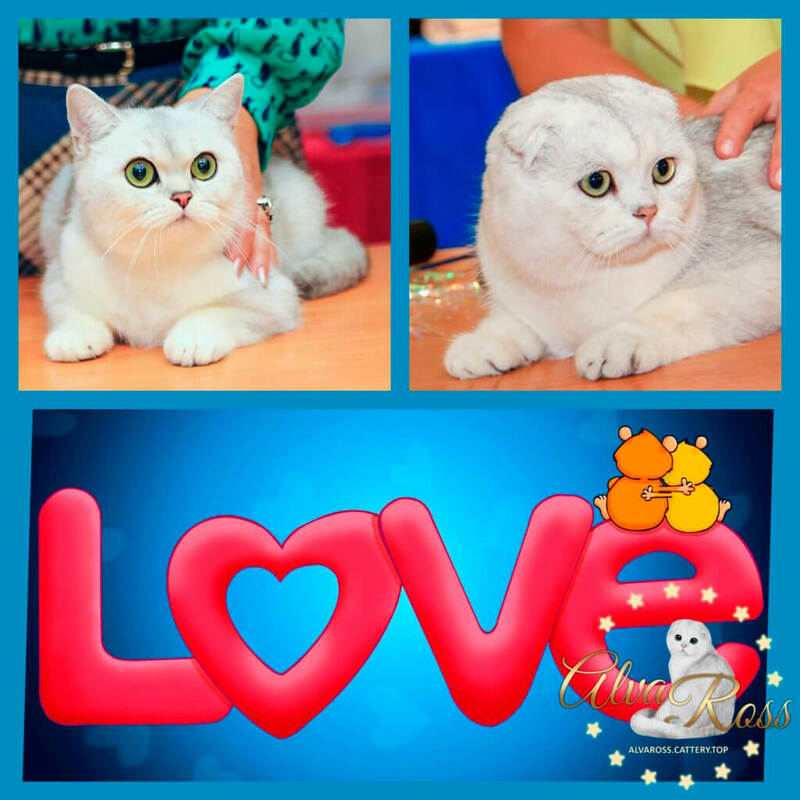 More information about the show achievements of this pair can be found by clicking on the link "Our victories at the international cat show in Volgograd!". The future litter is the first litter from Favorit-S N'Mike (SFS ns 11) and Michel' Artisan (SCS ns 25), but we already had kittens from this boy (look at the litter) and this cat (look at the litter). You can see them by clicking on the links above. After the birth of the kittens, I will write to you.